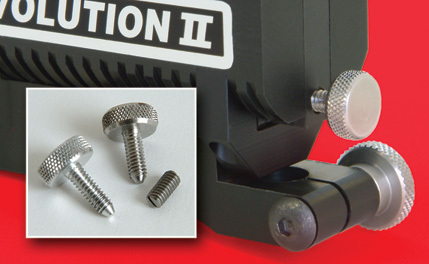 Change needle bars quickly and easily with this thumb screw made just for our Revolution Machines. This knurled thumb screw can replace the ball plunger set screw in Revolution machines purchased after December 2005. Machines bought prior to December 2005 will need to be retrofitted at our shop with new stainless steel threads in the armature bar. This conversion will make changes smoother and easier for years to come, whether you use the new thumb screw or continue to use the ball plunger set screw. Thumb screw is available in anodized aluminum or stainless steel. Aluminum is recommended for the original Revolution machines.